Every summer, every person I know who has a garden has a bumper crop of zucchini. Hopefully, today’s offering — as well as a few other recipes this week will go a long way towards solving that problem for you, or if not, at least provide some inspiration for when the next glut of zucchini hits your kitchen table. Slice zucchini into 1/4″ thick sticks, about 2 to 3 inches long. Next, add some chopped garlic and olive oil in a large skillet, and warm the oil over medium heat. When the garlic has turned a pale gold, after about 1 minute, add a couple of oil-packed anchovy fillets to the pan. Cook, stirring occasionally with a wooden spoon. The anchovies will spatter and eventually disintegrate into the oil. Add the zucchini to the skillet. Toss with the garlic and anchovy sauce so that it’s thoroughly coated with the oil. Taste for salt, although you shouldn’t need too much. Cook for 10 minutes or until the zucchini becomes golden brown. 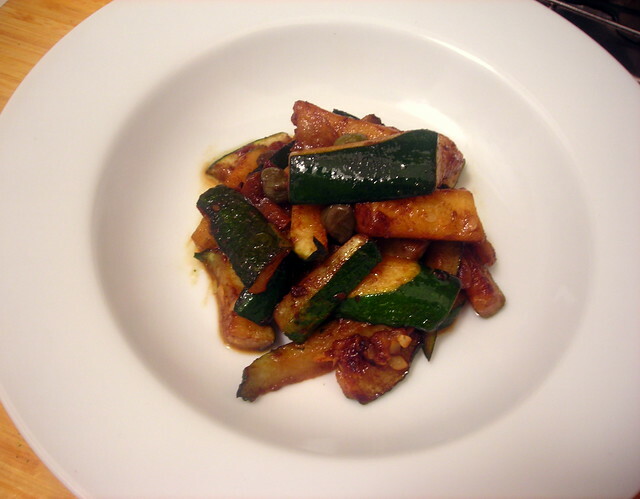 The zucchini are done when it becomes slightly caramelized. Stir in a few tablespoons drained capers and a couple of teaspoons red wine vinegar, if desired, and serve at once. 21 Aug	This entry was published on August 21, 2012 at 7:43 pm. It’s filed under food, food photography, Gluten-Free, Italian food, recipe, summer and tagged appetizer, food photography, gluten-free, Italian food, side dish, summer, zucchini. Bookmark the permalink. Follow any comments here with the RSS feed for this post. After years of gardening I gave up on zukes. Home grown zukes are not much better than store bought ones, they take over like Triffids, and squeeze out better crops like home grown toms. I’ve heard that zukes are the mint of the vegetable world. The way I look at it is, it’s the plant that keeps on giving, so therefore you need to find ways to use it. And that is a delicious problem to have. If I had a garden and an abundance of zucchini, I’d be donating all of the excess to everyone far and wide. Thanks for stopping by, Urspo!